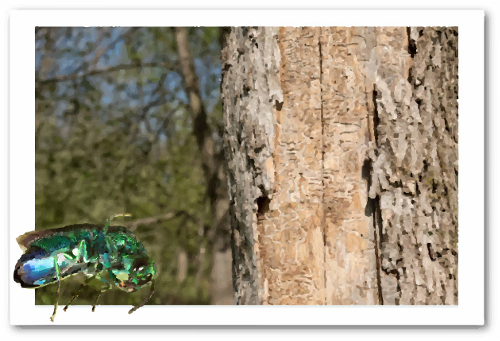 Have you ever heard of the Emerald Ash Borer Beetle? Well, if not you need to become familiar with it because this little green beetle can be deadly to human beings, especially if you are prone to hunting, camping, and fishing. This little seemingly insignificant bug has effectively set hundreds of thousands of deadfall traps, of dynamic proportions, throughout the American woodlands from coast to coast. This beetle has attacked and effectively eradicated the entire species of Ash trees in this nation and if you haven't noticed, they have left the skeletons standing all over the place. The Borer Beetle came from Asia and was introduced to America in Michigan. They weren't specifically devastating to our woodlands until the last five years. Most states made valiant effort to stop the spread of the beetle; however, it was all to no avail. The beetle spread from one end of the nation to another and has killed the Ash trees for the most part. The problem is that the tree dies so quickly that it becomes unstable. Unlike most trees dying of natural causes gradually, these dead ash start rotting in entirety immediately and become unstable. The result is that you can fall victim to a capsizing ash tree whenever and wherever you are. Motorists are even killed by these trees as they are driving down the road. Hunters need to be especially careful when hanging tree stands, fishermen should be cautious along the banks of streams and rivers, and if you are camping, make certain that your tent is pitched well away from dead ash trees that can fall on them at any time.